For other uses, see Fraser River (disambiguation). The Fraser River /ˈfreɪzər/ is the longest river within British Columbia, Canada, rising at Fraser Pass near Blackrock Mountain in the Rocky Mountains and flowing for 1,375 kilometres (854 mi), into the Strait of Georgia at the city of Vancouver. It is the 11th longest river in Canada. The river's annual discharge at its mouth is 112 cubic kilometres (27 cu mi) or 3,550 cubic metres per second (125,000 cu ft/s), and it discharges 20 million tons of sediment into the ocean. The river is named after Simon Fraser, who led an expedition in 1808 on behalf of the North West Company from the site of present-day Prince George almost to the mouth of the river. 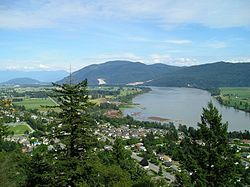 The river's name in the Halqemeylem (Upriver Halkomelem) language is Sto:lo, often seen archaically as Staulo, and has been adopted by the Halkomelem-speaking peoples of the Lower Mainland as their collective name, Sto:lo. The river's name in the Dakelh language is Lhtakoh. The Tsilhqot'in name for the river, not dissimilar to the Dakelh name, is ʔElhdaqox, meaning Sturgeon (ʔElhda-chugh) River (Yeqox). The Fraser drains a 220,000-square-kilometre (85,000 sq mi) area. Its source is a dripping spring at Fraser Pass. 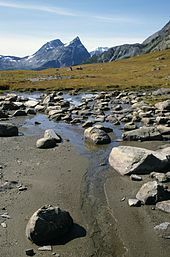 The river then flows north to the Yellowhead Highway and west past Mount Robson to the Rocky Mountain Trench and the Robson Valley near Valemount. After running northwest past 54° north, it makes a sharp turn to the south at Giscome Portage, meeting the Nechako River at the city of Prince George, then continuing south, progressively cutting deeper into the Fraser Plateau to form the Fraser Canyon from roughly the confluence of the Chilcotin River, near the city of Williams Lake, southwards. 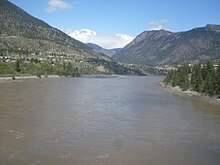 It is joined by the Bridge and Seton Rivers at the town of Lillooet, then by the Thompson River at Lytton, where it proceeds south until it is approximately 64 kilometres (40 mi) north of the 49th parallel, which is Canada's border with the United States. From Lytton southwards it runs through a progressively deeper canyon between the Lillooet Ranges of the Coast Mountains on its west and the Cascade Range on its east. Hell's Gate, located immediately downstream of the town of Boston Bar, is a famous portion of the canyon where the walls narrow dramatically, forcing the entire volume of the river through a gap only 35 metres (115 feet) wide. An aerial tramway takes visitors out over the river. Hells Gate is visible from the Trans-Canada Highway 1 about 2 km (1.2 mi) south of the tramway. 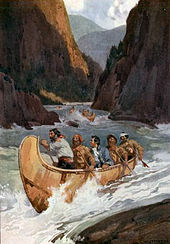 Simon Fraser was forced to portage the gorge on his trip through the canyon in June 1808. At Yale, at the head of navigation on the river, the canyon opens up and the river is wider, though without much adjoining lowland until Hope, where the river then turns west and southwest into a lush lowland valley, known as the Fraser Valley, past Chilliwack and the confluence of the Harrison and Sumas Rivers, bending northwest at Abbotsford and Mission, turning southwest again just east of New Westminster, where it splits into a North Arm, which is the southern boundary of the City of Vancouver, and the South Arm, which divides the City of Richmond from the City of Delta. Richmond is on the largest island in the Fraser, Lulu Island and also on Sea Island, which is the location of Vancouver International Airport; the eastern end of Lulu Island is within the City of New Westminster and is called Queensborough. Also in the lowermost Fraser, among other smaller islands, is Annacis Island, an important industrial and port area, which lies to the southeast of the eastern end of Lulu Island (Sea, Lulu and Annacis Islands lie between the North and South Arms. Other notable islands in the lower Fraser are Barnston Island, Matsqui Island, Nicomen Island and Sea Bird Island. Other islands lie on the outer side of the estuary, most notably Westham Island, a wildfowl preserve, and Iona Island, the location of the main sewage plant for the City of Vancouver. After 100 kilometres (about 60 mi), it forms a delta where it empties into the Strait of Georgia between the mainland and Vancouver Island. The lands south of the City of Vancouver, including the cities of Richmond and Delta, sit on the flat flood plain. The islands of the delta include Iona Island, Sea Island, Lulu Island, Annacis Island, and a number of smaller islands. 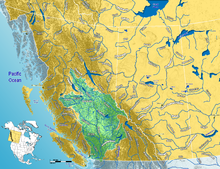 While the vast majority of the river's drainage basin lies within British Columbia, a small portion in the drainage basin lies across the international border in Washington in the United States, namely the upper reaches of the tributary Chilliwack and Sumas rivers. Most of lowland Whatcom County, Washington is part of the Fraser Lowland and was formed also by sediment deposited from the Fraser, though most of the county is not in the Fraser drainage basin. Similar to the Columbia River Gorge east of Portland, Oregon, the Fraser exploits a topographic cleft between two mountain ranges separating a more continental climate (in this case, that of the British Columbia Interior) from a milder climate near the coast. When an Arctic high-pressure area moves into the British Columbia Interior and a relatively low-pressure area builds over the general Puget Sound and Strait of Georgia region, the cold Arctic air accelerates southwest through the Fraser Canyon. These outflow winds can gust up to 97 to 129 kilometres per hour (60 to 80 mph) and have at times exceeded 160 kilometres per hour (100 mph). Such winds frequently reach Bellingham and the San Juan Islands, gaining strength over the open water of the Strait of Juan de Fuca. The estuary at the river's mouth is a site of hemispheric importance in the Western Hemisphere Shorebird Reserve Network. The Water Survey of Canada currently operates 17 gauge stations that measure discharge and water level along the majority of the mainstem from Red Pass just downstream of Moose Lake within the Mount Robson Provincial Park to Steveston in Vancouver at the river mouth. With an average flow at the mouth of about 3,475 cubic metres per second (122,700 cu ft/s), the Fraser is the largest river by discharge flowing into the Pacific seaboard of Canada and the fifth largest in the country. The average flow is highly seasonal; summer discharge rates can be ten times larger than the flow during the winter. The Fraser's highest recorded flow, in June 1894, is estimated to have been 17,000 cubic metres per second (600,000 cu ft/s) at Hope. It was calculated using high-water marks near the hydrometric station at Hope and various statistical methods. In 1948 the Fraser River Board adopted the estimate for the 1894 flood. It remains the value specified by regulatory agencies for all flood control work on the river. Further studies and hydraulic models have estimated the maximum discharge of the Fraser River, at Hope during the 1894 flood, as within a range of about 16,000 to 18,000 cubic metres per second (570,000 to 640,000 cu ft/s). On June 14, 1792, the Spanish explorers Dionisio Alcalá Galiano and Cayetano Valdés entered and anchored in the North Arm of the Fraser River, becoming the first Europeans to find and enter it. The existence of the river, but not its location, had been deduced during the 1791 voyage of José María Narváez, under Francisco de Eliza. The upper reaches of the Fraser River were first explored by Sir Alexander Mackenzie in 1793, and fully traced by Simon Fraser in 1808, who confirmed that it was not connected with the Columbia River. In 1828 George Simpson visited the river, mainly to examine Fort Langley and determine whether it would be suitable as the Hudson's Bay Company's main Pacific depot. Simpson had believed the Fraser River might be navigable throughout its length, even though Simon Fraser had described it as non-navigable. 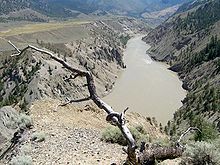 Simpson journeyed down the river and through the Fraser Canyon and afterwards wrote "I should consider the passage down, to be certain Death, in nine attempts out of Ten. I shall therefore no longer talk about it as a navigable stream". His trip down the river convinced him that Fort Langley could not replace Fort Vancouver as the company's main depot on the Pacific coast. Much of British Columbia's history has been bound to the Fraser, partly because it was the essential route between the Interior and the Lower Coast after the loss of the lands south of the 49th Parallel with the Oregon Treaty of 1846. It was the site of its first recorded settlements of Aboriginal people (see Musqueam, Sto:lo, St'at'imc, Secwepemc and Nlaka'pamux), the route of multitudes of prospectors during the Fraser Canyon Gold Rush and the main vehicle of the province's early commerce and industry. In 1998, the river was designated as a Canadian Heritage River for its natural and human heritage. It remains the longest river with that designation. The Fraser is heavily exploited by human activities, especially in its lower reaches. Its banks are rich farmland, its water is used by pulp mills, and a few dams on some tributaries provide hydroelectric power. The main flow of the Fraser has never been dammed partly because its high level of sediment flows would result in a short dam lifespan, but mostly because of strong opposition from fisheries and other environmental concerns. In 1858, the Fraser River and surrounding areas were occupied when the gold rush came to the Fraser Canyon and the Fraser River. It is also a popular fishing location for residents of the Lower Mainland. The Fraser Herald, a regional position within the Canadian Heraldic Authority is named after the river. Fraser River as seen from the grounds of Westminster Abbey, above Hatzic in Mission, British Columbia. Sumas Mountain in background. The Fraser River is known for the fishing of white sturgeon, all five species of Pacific salmon (chinook, coho, chum, pink, sockeye), as well as steelhead trout. A typical white sturgeon catch averages between 14 to 45 kilograms (30 to 100 lb). A large white sturgeon weighing an estimated 500 kilograms (1,100 lb) and measuring 3.76 metres (12 ft 4 in) was caught and released on the Fraser River in July 2012, but it was reportedly measured nose to tip of tail, not nose to fork as is the officially recognized method for accurate measurement of this species. Thus the reported length of this fish, and its estimated weight, were likely greater than what its actual measurements would have been if standard data collection had been utilized in this case. Regardless of this discrepancy, landing large sturgeon like this is reasonably uncommon, however fish nearing or achieving this size are caught on rod and reel in the Fraser river virtually every year, and reports of even larger fish being lost occur with fair regularity. A variety of guiding outfits throughout the Fraser valley and lower mainland offer services to pursue this magnificent sportfish. After European settlement, the first disastrous flood in the Fraser Valley occurred in 1894. With no protection against the rising waters of the Fraser River, Fraser Valley communities from Chilliwack downstream were inundated with water. In the 1894 floods, the water mark at Mission reached 7.85 metres (25.75 ft). After the 1894 flood, a dyking system was constructed throughout the Fraser Valley. The dyking and drainage projects greatly improved the flood problems, but unfortunately over time, the dykes were allowed to fall into disrepair and became overgrown with brush and trees. With some dykes constructed of a wooden frame, they gave way in 1948 in several locations, marking the second disastrous flood. Flooding since 1948 has been minor in comparison. 1948 saw massive flooding in Chilliwack and other areas along the Fraser River. The high-water mark at Mission rose to 7.5 metres (24.7 ft). Throughout the May 24 long weekend, the waters of the Fraser were rising steadily, but only a few thought any real danger lay ahead. On May 28, 1948, the Semiault Creek Dyke broke. On May 29, 1948, dykes near Glendale (now Cottonwood Corners) gave way and in four days, 49 square kilometres (12,000 acres) of fertile ground were under water. On June 1, 1948, the Cannor Dyke (east of Vedder Canal near Trans Canada Highway) broke and released tons of Fraser River water onto the Greendale area, destroying homes and fields. On June 3, 1948, the steamer Gladys supplied flood-stricken Chilliwack with tents and provisions as well as moving people and stock onto high ground. Cool temperatures during March, April and early May had delayed the melting of the heavy snowpack that had accumulated over the winter season. Several days of hot weather and warm rains over the holiday weekend in late May hastened the thawing of the snowpack. Rivers and streams quickly swelled with spring runoff, reaching heights surpassed only in 1894. Finally, the poorly maintained dike systems failed to contain the water. At the height of the 1948 flood, 200 square kilometres (50,000 acres) stood under water. Dykes broke at Agassiz, Chiliwack, Nicomen Island, Glen Valley and Matsqui. By the time the flood waters receded a month later, 16,000 people had been evacuated, damages totaled $20 million. Tributaries are listed from the mouth of the Fraser and going up river. ^ Indigenous name recorded by Alexander Mackenzie on expedition to find Columbia River’s headwaters; circa 18-? ^ a b c "Fraser River Fact Sheet". Canadian Heritage Rivers System. Retrieved December 2, 2016. ^ a b c "Comprehensive Review of Fraser River at Hope: Flood Hydrology and Flows, Scoping Study Final Report" (PDF). BC Ministry of Environment. October 2008. Retrieved October 11, 2009. ^ "Fraser River Delta". Ramsar Sites Information Service. Retrieved April 25, 2018. ^ "Fraser River". BC Geographical Names. ^ "North Arm Fraser River". BC Geographical Names. ^ Mass, Cliff (2008). The Weather of the Pacific Northwest. University of Washington Press. pp. 146–148. ISBN 978-0-295-98847-4. ^ "Ambient Water Quality Assessment and Objectives for the Fraser River Sub-basin from Kanaka Creek to the Mouth". British Columbia Ministry of Environment, Water Management Branch, Resource Quality Section. November 1985. Retrieved October 11, 2009. ^ a b Ferguson, John W.; Michael Healey (May 2009). "Hydropower in the Fraser and Columbia Rivers". Catch and Culture (newsletter). Mekong River Commission. Retrieved October 11, 2009. ^ Mackie, Richard Somerset (1997). Trading Beyond the Mountains: The British Fur Trade on the Pacific 1793-1843. Vancouver: University of British Columbia (UBC) Press. p. 58. ISBN 0-7748-0613-3. ^ "Fraser River". Canadian Council for Geographic Education. Archived from the original on April 17, 2005. ^ River Water Still Rising. Prince George Free Press, June 6, 2006. ^ Fraser flood alert imminent Mission gauge under close scrutiny, river likely to peak at 7.5 m by Saturday. Langley Times, June 6, 2007. Boyer, David S. (July 1986). "The Untamed Fraser River". National Geographic. Vol. 170 no. 1. pp. 44–75. ISSN 0027-9358. OCLC 643483454. Wikimedia Commons has media related to Fraser River.